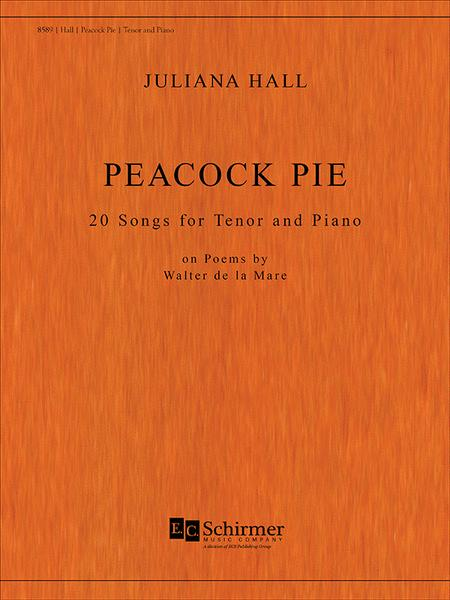 Composed by Juliana Hall (1958-). Secular, 21st century. E.C. Schirmer Publishing #8589. Published by E.C. Schirmer Publishing (EC.8589). 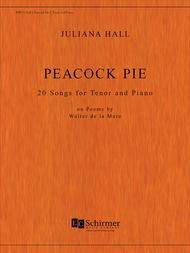 Peacock Pie is a collection of 20 short songs based on Walter de la Mare's book of childrens' poetry first published in 1913. This is a song cycle of boys in childhood, fancifully portraying the pets, school experiences, tales of knights and horsemen, long summer days, and life's lessons learned while growing up - told with humor, affection, imagination, and courage. Duration: 26:00 Contents: 1. The Horseman 2. The Bandog 3. The Sea Boy 4. Jim Jay 5. Cake and Sack 6. The Huntsman 7. Tired Tim 8. The Dunce 9. Poor Henry 10. The Quartette 11. Full Moon 12. Summer Evening 13. Five Eyes 14. The Ruin 15. All But Blind 16. Will Ever? 17. The Penny Owing 18. The Horseman 19. The Song of the Mad Prince 20. The Song of 'Finis' .